It’s called Five Minute Friday. Each week, we write for five minutes, freely, on a one-word prompt. We write quickly, then post, a flash-mob linking together at Kate Motaung’s site. We sit in waiting rooms and wait in line. We wait for our plane, our elevator, and our turn. And it all seems so passive, so idle, so … boring. So when we’re told in scripture to wait for the Lord, we grab a magazine, yawn, and settle in to our easy chairs for a holy pause in action. When God calls us to wait, are we sentenced to a season of boredom? My husband worked at a restaurant in high school and college. It seems ironic that someone who had a sweaty shirt and aching feet at the end of every shift would be called a “waiter”. Waiters are not in control of much, but they are responsible for many things. They can’t do much planning, but they must do a lot of watching, responding, and working. It’s impossible for them to predict who or what they serve, but they must dress up, show up, and be ready. I think this is a much more accurate picture of what God wants from us when He tells us to wait on Him. So many times, we feel called to wait on the Lord, but then we hunker down under our afghans for snoresville. Somehow we’ve equated waiting with taking a break from working, watching, or serving. When things are out of our hands, we tend to fold them in our lap and twiddle our thumbs. But waiting can be intensely busy and even sweaty. 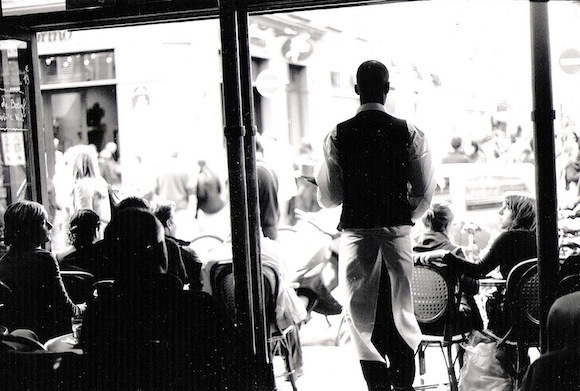 Waiters can feel invisible or like entertainers. But it’s always for a higher name and a bigger purpose. Have you been called to wait for the Lord? Well, you better tie your apron, stop yawning, and open your eyes. Keep watch and on your toes, for you just might be in for the busiest shift of your life. Oh! I’ve never thought of it this way, Karen! This is exactly how we should wait–still serving, still attending, eyes wide open to see the need. Too often I sit in my chair and try to think positive thoughts and tap my foot with impatience.